Vmedia Trying To Bring Back The Minidisc | OhGizmo! Minidiscs used to be the coolest things ever. The players were tiny and awesome, and technology itself was miles ahead of the CD if for no other reason than most Minidisc players could also record. Plus, the little disc cartridges were pretty slick. A company called Vmedia is trying to convince netbook manufacturers that bite-size optical media is still relevant, and that Vmedia drives are worthwhile additions their computers. 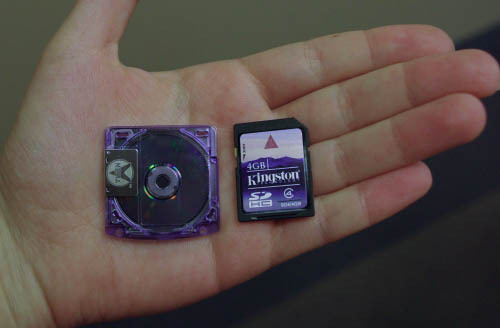 Vmedia discs are similar to Minidiscs in appearance, but they’re actually even smaller, measuring only 36mm x 36mm (Minidiscs are not quite twice that size). They can hold 1 or 2 gigs of data and are optionally rewritable. This is all well and good, but Vmedia’s biggest competitor is probably going to be SD cards, which are smaller, cheaper, faster, more reliable, more reusable, and have significantly higher capacities. Why does Vmedia think they stand a chance? They’ll tell you, after the jump. So why buy a Vmedia disc over an SD Card with preloaded content, like SanDisk is attempting with music and its slotMusic platform? And as for the upsell over downloadable content, “Vmedia is about is customer choice. Right now we are in a time when consumers have a lot of choices in how they can consume media and on the mobile side there are fewer choices. The shift to downloaded video is going to take quite a while, and Vmedia fills that gap right now,” Volan said. While it’s true that we’re not yet at the point where we have ubiquitous access to streaming media, I think a brand new proprietary format that requires significant hardware integration is not the answer. Yes, it would great to be able to watch movies on my netbook, and yes, I think making netbooks with conventional optical drives isn’t the solution. But I’m not willing to pay a premium for hardware and media that will allow me to do that and not much else, and that will be rendered obsolete as soon as mobile broadband (WiMax or 4G) becomes a reality (I’m bullish on that). In the meantime, I’m willing to either rip my DVDs and stick them on my netbook directly, or just suffer and read a newspaper or something. It would be great to have the most talked about gadget back to our pockets. Hope it makes it this time around..
With 3 GB capacity this would be great. Even the blue laser inside would be quite cool. But tell me one good reason why we should return to optical media when SD cards do the trick just fine. Are they public? Can I short their stock? The argument seems rather specious at best. Please tell me they are public, what their ticker symbol is, and if they're trading over the limit of being able to short the stock. there is good cause for discussion over solid state formats over optical devices is in long term stability and recurrence in transferred viral infection of data and random bits of code when managing new devices or restoring old ones.